I am excited to share this beauty! I was contacted by this client in regards to another piece, but it was gray and she had her heart set on white. I just so happened to have this gorgeous serpentine front dresser in my Available Inventory - check it out if you've been considering having a piece custom crafted for your space! This client's room involved reclaimed wood and some rustic accents, so a bright white with just a hint of distressing was a gorgeous addition. 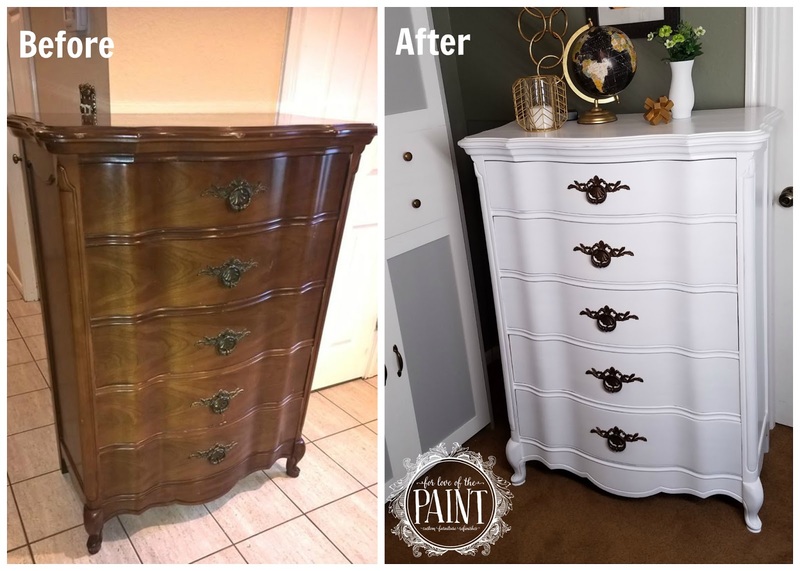 For this piece I selected General Finishes Snow White Milk Paint and High Performance Top Coat. Read more for tips on achieving the look! Although I love the end result, I needed 4 or 5 coats of the white paint in order to get the opaque coverage I needed. I had been using a flat brush for the first few coats, but switched to a softer round brush that gave me more of a "cloud" effect, and it really helped to have the two different styles layered in order to get the coverage I wanted! I might try the General Finishes white chalk style paint and see how it compares for the next project. The traditional original hardware is absolutely stunning in contrast! I like to wait until the end of a project to see the way the hardware will work with the new finish before committing to a decision on whether or not to update the color. Although I've been obsessed with gold accents lately, the bronze is a gorgeous option, and it worked fabulously with the dresser!